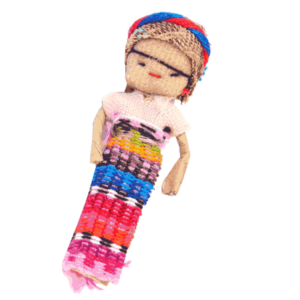 The Worry Doll is a great item, that only add $0.20 in postage to your mailing! The Worry Doll is approx 1″ high and 1/4″ thick. This letter, using a Guatemalan worry doll, is designed to be used for lost/inactive client reactivation. This is similar to our very popular and very successful boomerang lost client mailer we created 4 years ago. To review, a lost client is a past client who, for whatever reason, has not made a purchase with you after a certain amount of time. The time where a client becomes ‘lost’ varies from business to business. For example, a lunch spot by your office may say you’re lost if you haven’t been back in for 2 weeks. For a dentist, it’s every six months. A high-end jeweler may say it’s every 1-2 years. As the marketer of your business, you need to ask yourself what logical time frame a happy, well treated customer should come back for another sale. You want to find that number and send those clients something right before that time. This worry doll is great way to do that. Yes, I really am worried about you. Judy (our office manager) was checking on our past clients and she realized that it’s been too long since we’ve heard from you at My City Dental Care. In order to keep a healthy smile you should visit the dentist every 6 months to be sure your mouth is healthy and free of cavities and other problems that can sneak up on you. $100.00 Savings Certificate towards your next visit! But you’ve got to call and make your appointment before June 30th to get in on this great opportunity. Call 000-000-0000 to schedule your next appointment and mention that you received the worry doll and we’ll be sure you get either the $97 teeth whitening or $100.00 saving certificate towards your next visit. P.S. Remember, this great deal is only available until the end of the month so be sure to call 000-000-0000 today!